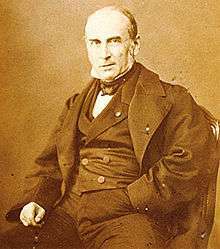 Pierre Guillaume Frédéric Le Play (French: [lə.plɛ]; April 11, 1806 – April 5, 1882) was a French engineer, sociologist and economist. The son of a custom-house official, Le Play was educated at the École Polytechnique and the École des Mines. In 1834, he was appointed chairman of the permanent committee of mining statistics. In 1840, he became engineer-in-chief and professor of metallurgy at the École des Mines, where he became inspector in 1848. For nearly a quarter of a century Le Play travelled around Europe, collecting a vast amount of material bearing on the social and economic condition of the working classes. In 1855, he published Les Ouvriers Européens, a series of 36 monographs on the budgets of typical families selected from a wide range of industries. This work was crowned with the Montyon prize conferred by the Académie des Sciences. In 1856, Le Play founded the Société internationale des études pratiques d'économie sociale, which has devoted its energies principally to forwarding social studies on the lines laid down by its founder. The journal of the society, La Réforme Sociale, founded in 1881, is published fortnightly. Napoleon III, who held him in high esteem, entrusted him with the organization of the Exhibition of 1855, and appointed him counsellor of state, commissioner general of the Exhibition of 1867, senator of the empire and Grand Officer of the Légion d'honneur. Initially an atheist, Le Play gradually became convinced of the need for religion. In 1864, he published an essay defending Christianity against Darwinism and Scepticism. He converted to Roman Catholicism in 1879, three years before his death. Blum (2004) included Le Play in his anthology of French counter-revolutionary thinkers. Statue of Frédéric Le Play, by André-Joseph Allar, at the Jardin du Luxembourg (Paris, 1906). Le Play, by L. Rousseau, 1879. Bust of Frédéric Le Play, by Chapu, 1869. (1871). L'Organisation de la Famille. (1872). The Organization of Labor in Accordance With Custom and the Law of the Decalogue. Philadelphia: Claxton, Remsen & Haffelfinger. (1962). "Household Economy." In: Parsons, Talcott et al., editors, Theories of Society. The Free Press of Glencoe, Inc.
(1982). Frederic Le Play on Family, Work, and Social Change. Silver, Catherine Bodard, editor and translator, University of Chicago Press. (2004). "Social Reform in France." In: Blum, Christopher Olaf, editor and translator, Critics of the Enlightenment. Wilmington DE: ISI Books, pp. 197–258. ↑ Herbermann, Charles, ed. (1913). "Pierre-Guillaume-Frédéric Le Play". Catholic Encyclopedia. New York: Robert Appleton Company. Brooke, Michael Z. (1970). Le Play, Engineer and Social Scientist: The Life and Work of Frederic Le Play. Harlow UK: Longmans. Herbertson, Fanny Louisa Dorothea (1950). The Life of Frédéric Le Play, Ledbury, Herefordshire: Le Play House Press. Beaver, S. H. (1962). "The Le Play Society and Field Work," Geography 47 (3), pp. 225–240. Beum, Robert (1997). "Ultra-Royalism Revisited," Modern Age 39 (3), pp. 290–322. Healy, Mary Edward (1947). "Le Play's Contribution to Sociology: His Method," The American Catholic Sociological Review 8 (2), pp. 97–110. Herbertson, Dorothy (1920). "Le Play and Social Science," The Sociological Review 12 (2), pp. 108–110. Higgs, Henry (1890). "Frédéric Le Play," The Quarterly Journal of Economics 4 (4), pp. 408–433. Pitt, Alan (1998). "Frédéric Le Play and the Family: Paternalism and Freedom in the French Debates of the 1870's," French History 12 (1), pp. 67–89. Rousiers, Paul De (1894). "La Science Sociale," Annals of American Academy of Political and Social Science 4 (4), pp. 128–154. Sorokin, Pitirim A. (1928). "Frederic Le Play's School." In: Contemporary Sociological Theories, New York: Harper, pp. 63–98. Swinny, S. H. (1921). "The Sociological Schools of Comte and Le Play," The Sociological Review 13 (2), pp. 68–74. Zimmerman, Carle Clark (1935). "Le Play Theories." In: Family and Society. New York: D. Van Nostrand Company, Inc., p. 71. Wikimedia Commons has media related to Pierre Guillaume Frédéric le Play.